With the teams sitting 5th & 6th respectively in Yorkshire 3, this fixture promised to be a tough encounter, with the modern game often shaking the bones (metaphorically) of older, ex players and spectators. Physical, sometimes brutal, we have come to expect lots of “route one” and when we see an England winger make a mess of a three-on-two, we mutter about the old days: draw a man, time the pass, never die with the ball if there is rugby to be played outside you!! Ah well! We turn up in numbers and we try to be positive. Today’s game brought difficulties for both clubs, with Northallerton shorn of 7 players through injury and ‘Ensians losing both centres in the warm-up. There was also an injury to a visiting player in the first minute and a lengthy delay ensued. On the restart, Northallerton were quickly in charge through their taller and heavier pack and with the wind at their back and a light drizzle probably helping their declared style of forward play, sustained pressure and continuous possession put them two tries to the good after only a quarter of an hour. 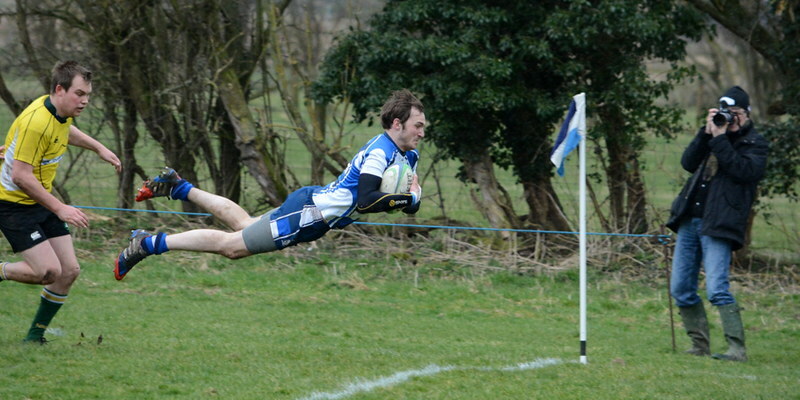 Both conversion attempts failed, but it looked at this point that ‘Ensians were in for a hard day at the office. At the risk of stating the obvious, rugby with the ball is infinitely easier than without it and for long periods the home side suffered the latter and had to defend and tackle continuously. However, when the ball did come to hand with opportunities, they looked very dangerous and Will Howarth fell just short of the try line after a good run. On the other wing, Declan Jackson, as he so often does, ran brilliantly to beat his man on the outside and cross the line, only to be called back having been adjudged to have put a foot in touch. This wasn’t a popular decision with the unbiased ‘Ensian spectators right on the spot and after two lovely runs by the wingers, the home side frustratingly remained scoreless. Then, almost immediately, Nathan Rogers followed up a kick ahead on the left, the bounce was beautiful and he gathered and went under the posts. The same player improved his own try and the scoreboard moved to 7-10. We now saw an upsurge in ‘Ensian confidence and following some real pressure, Zak Stead raced over for the second try. The conversion failed and Northallerton’s forwards were again dominating the line-out and causing disruption to the ‘Ensian scrum. However, the hosts are nothing if not great- tackling defenders and their lead of 12-10 held until half time. The rain had stopped and ‘Ensians would now have the benefit of the, albeit fairly light, wind. Northallerton had used their threes from time to time, but clearly believed that the forwards would win them the game. When they were in full cry with the rolling maul, ‘Ensians certainly had difficulty holding them, but the tackling of the whole side was strong and to lead going into the break was a good feat. On the restart ‘Ensians were quickly on the attack, but fell foul of the referee (not for the first time) and possession and territory went back to the visitors. A tremendous driving maul was unstoppable and the resulting try seemed to prove their point. A very good conversion gave the visitors the lead again at 17-12. In a forward-dominated game, both sets of backs were good with (limited)ball in hand chances, their no 10 controlling play well, but the home backs really were capable of testing the opposition. An ‘Ensian kick ahead put the Northallerton full back under pressure and a penalty was given away. Jackson ‘s kick was successful and made the difference just two points. The visitors stuck to their game plan, but the hosts stole the ball and a good break by Rogers led to Olly Eaves taking an inside pass and scoring after a great run. A superb Jackson conversion gave ‘Ensians some breathing space at 22-17 and Declan Jackson had a lovely run, only to see yet another Northallerton penalty put them back into their 22. Intense pressure, tremendous defence, possession was regained and a relieving kick took the home side out of danger. A tap penalty saw Eaves run strongly to almost score, a penalty was awarded to ‘Ensians and Jackson put three points on the scoreboard to make it 25-17. Northallerton persisted with the pick-and-drive strategy and the game as a spectacle nosedived, but the home forwards enjoyed the hard exchanges and some of their defence was outstanding. The referee was not always in sympathy with the team in blue and Rob Arbuckle was sin-binned for apparent repeated infringements. A desperate relieving kick by Rogers from his own in-goal area struck an upright and went dead, resulting in a 10-metre scrum to the visitors. Possession went to the ‘Ensians and Stead kicked them towards halfway. Pressure earned a penalty and Stead found a good touch. It was all the home side now, Northallerton were looking tired and the men in yellow were pinned in their 22. A relieving kick repelled the home side, but the ball was run back and a kick ahead gave Will Howarth the chance of a bonus point and glory; the combination of eagerness and a bouncing, rolling ball proved too much and the unfortunate knock-on brought the game to a close. Northallerton’s tactics were perhaps due to the make-up of the side and for long periods they certainly had much of the game; ‘Ensians showed that tenacious defence and limited possession can still allow some “proper” rugby: home spectators shuddered at the hard stuff but revelled in the running of the ‘Ensian threes, an exiting and talented line indeed, despite the enforced reshuffle after the warm up. This was a very satisfying win for Old Otliensians, who are more than holding their own in Yorkshire 3.